REMBE Elevent pressure and vacuum relief valve provides optimum protection against overpressure and vacuum for storage tanks with low design pressures. Edible oils such as palm, soy, and coconut oils are frequently used in the manufacturing of processed foods. Cookies, chocolate, and ice cream are only a few examples in a long list of such foodstuffs. Almost every processed and packaged food that we eat nowadays contains some form of edible oil. One of the main challenges for the use of such oil in food production is maintaining quality and shelf life. Oxidation is a chemical reaction caused by exposing the oil to oxygen which, in turn, causes the oil to turn rancid, changing its color, flavor, and aroma. This can occur during processing such as deep fat frying or during the normal storage of such oils. There are a number of methods to avoid oxidation of edible oils, but blanketing storage vessels with an inert gas like nitrogen is a popular choice to prevent the oil being exposed to oxygen and avoiding the use of chemical antioxidants. Nitrogen blanketing systems work under a low level of pressure and therefore require pressure protection. The REMBE Elevent is a pressure and vacuum relief valve that provides optimum protection against overpressure and vacuum for storage tanks with low design pressures. 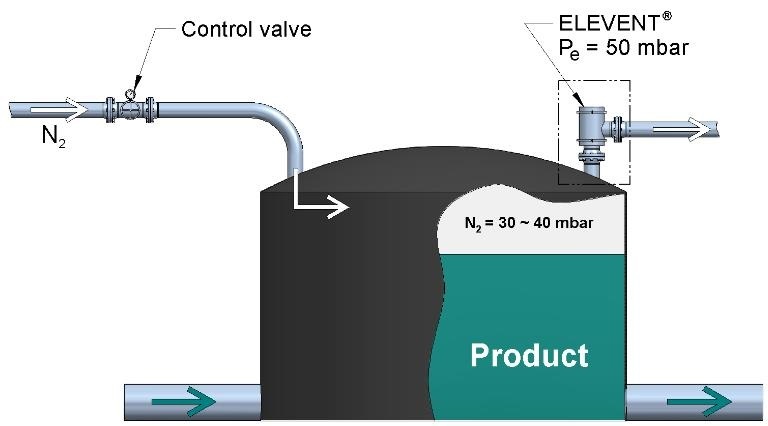 The extremely low leak-rate (1x 10-2 mbar x l/sec) guarantees a controlled level of pressure in the tank and prevents both the loss of nitrogen and air getting entering the system. High-quality materials of construction (316 stainless steel as a minimum) mean that it is ideal for sanitary and food grade applications. The Elevent can be installed via tri-clamp connections and the modular construction facilitates easy dismantling for cleaning. The Elevent is used to protect storage tanks of leading global producers of milk products, chocolate and soft drinks, as well as in other industries with high product purity and stringent quality requirements such as the pharmaceutical industry.